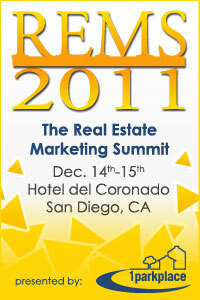 The 2011 Real Estate Marketing Summit will be returning to the Hotel del Coronado in San Diego, on December 14th-15th, 2011. REMS 2010 was a huge success and this year is going to be even better! In the coming days we will be making updates as we book new speakers and finalize the details of the event. San Diego, CA 92150 - 1682.